Over the next few weeks I will be selling some of the best pieces from my collection. I have worked in the record industry since the 1960s, and as a teenage plugger for Decca in the mid-60s I witnessed the birth of many of these 45s, and received the earliest copies of them. 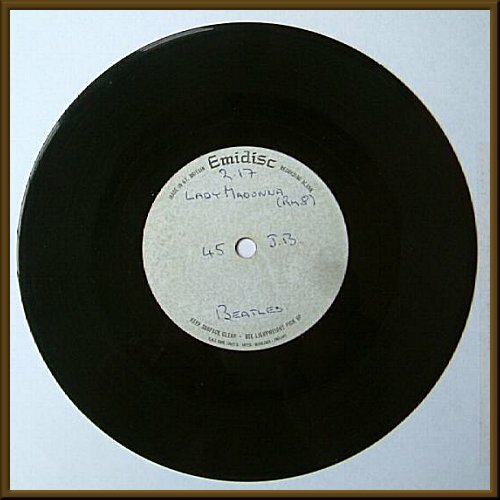 Many are promos, and there are demos and acetates aplenty. Bands represented include the Beatles, the Stones, Bowie and others, as well as legendary psychedelic one-offs. 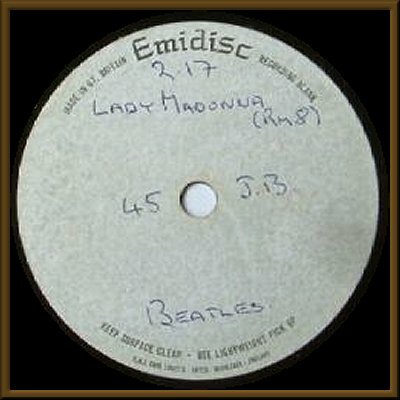 On offer here is an original one-sided acetate of Lady Madonna on EMI's in-house 'Emidisc' label. I have not played this for fear of deteriorating it, but from memory, it is the same as the released version, though it's possible that fans might detect a difference. The running time is given on the label as '2.17' and 'RM 8' is also written on, which almost certainly refers to the room/studio it was cut or recorded in. Glossy and clean with a few minor surface marks - nothing major. Quite frankly, it's miraculous that it has survived in this state. The label shows minor signs of age, but no tears or damage. I have barely ever seen a 1960s acetate in such impressive condition. PLEASE NOTE THAT THIS IS A GUARANTEED ORIGINAL AND NOT A COUNTERFEIT.